Institute of Management Technology (IMT), Nagpur witnessed a four day extravagant event, Milestone 34 which was organised by the Milestone Committee from August 29, 2018 to September 01, 2018. 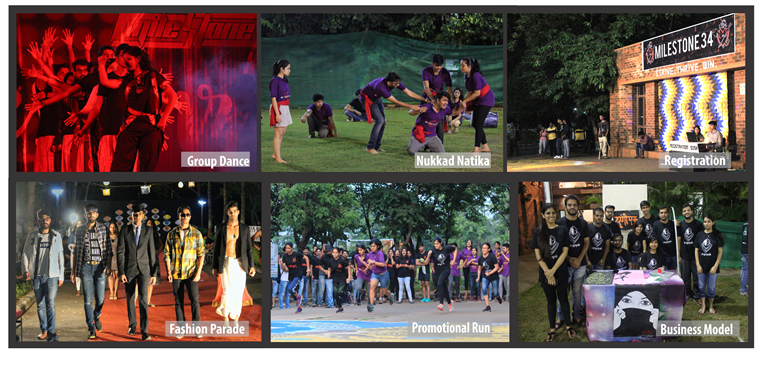 It is an intra-college event in which various teams participate to compete in cultural and managerial competitions. The theme of the event was Pinhaa.n- The Hidden Dimension. The event commenced with a promotional run where participants showed their athletic spirit and raced to get the most enviable spots for the best display of their team banner. The event was declared open with lighting of lamp by Prof Pradeep Mazumdar and Dr Narendra Phadnis on August 29, 2018. Three teams comprising of approximately 20 members each took part in the event. The academic forums organised various innovative games such as ‘Knight Stake’ by AnalytiX- the Business Analytics and Information Technology forum, ‘Fin-e-qursan’ by Finaholics- the Finance forum, ‘TRAIL2PEAK’ by Cyclops- the Operations forum, ‘Kleider Maker’ by Okonomos- the Economics forum, ‘Zona De Guerra’ by XploHRe- the Human Resource forum, ‘Marque Avenue’ by Marque- the Marketing forum wherein the students performed to the best of their abilities. Various fun and stress buster games were organised by non-academic forums and clubs such as Inshades- the art club, Envision- the entertainment forum, QuizWiser- the quizzing forum, Literati- the literature club and Centre for Sustainability Growth and Development. A cricket tournament was also organised by the Sports committee. These creative and intellectual games explored the hidden talents of the participants in different arenas. In the midst of playoffs, the participants got the chance to show the competitive spirit and sheer talent when they battled it out in Dance Face-Off. The competing teams got the opportunity to break free from the barriers of their minds through a role play in the Ice Breaker round. They also unveiled their acting skills through Nukkad Natika and kept the crowd engaged by showcasing the best of their appealing skills. When the air was filled with drama and creativity, the participants came up with innovative Business Models keeping in sync with the theme of the event which uncovered their entrepreneurial skills. This zestful event became more grandiose with theme-based Fashion Parade where the participants walked the ramp with panache. This was followed by Group Dance ‘Expressionz’ which saw the participants show off their best moves. Finally, the four day grand event culminated into DJ night where the entire IMT family came together and danced throughout the night to the upbeat music. The participants await the final results and the winning team will be felicitated with a trophy and cash prize.